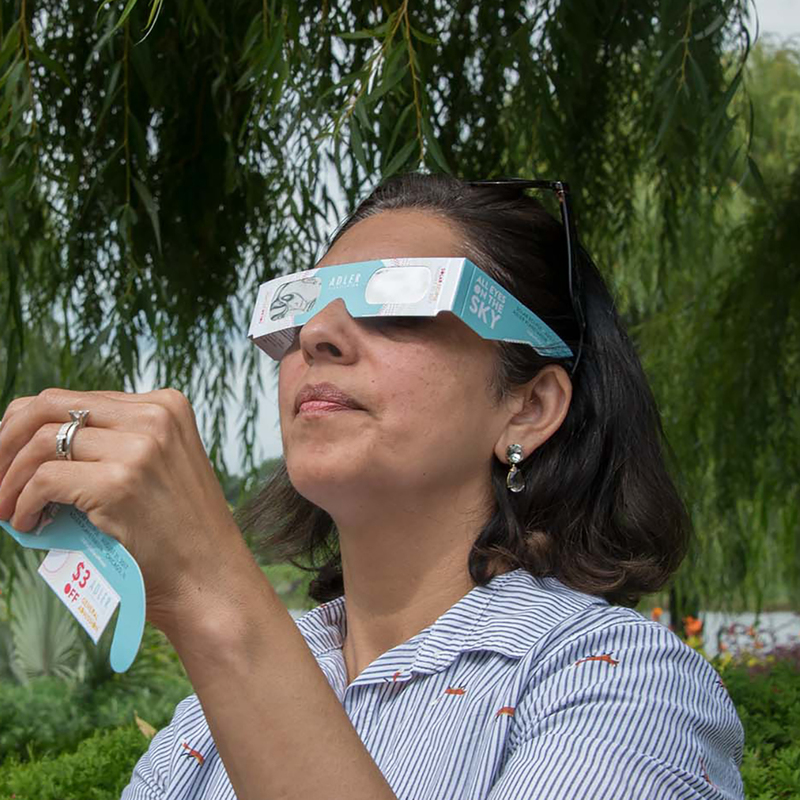 We love nature here at the Chicago Botanic Garden, so we looked to the natural world for inspiration on how to enjoy the eclipse—here at the Garden, or in your own backyard. Practice safe viewing at the Garden with eclipse glasses from the Adler Planetarium. Distribution of glasses begins at 10 a.m. Monday, August 21 on the Esplanade. On Monday, August 21, people across the United States will be able to witness a rare event: the first total solar eclipse to cross over the country from coast to coast in nearly a century. The path of totality—meaning the area of the United States that will see the sun completely blocked by the moon—passes across southern Illinois. In the Chicago area, we will experience roughly 86 percent coverage around 1:19 p.m. This is the closest the Chicago area has been to a total solar eclipse in 92 years. 1. Make a pinhole projector—using leaves. Rule number one with eclipses—and with the sun every day, actually—is don’t look directly at it with the naked eye. A fun way to indirectly “see” the eclipse is with a pinhole projector, and one of the best natural projectors is a leaf. Leaves often have holes that can act as natural projectors. During the eclipse, turn your back to the sun and hold the leaf above a neutral colored background, ideally several feet or more away. A white sheet of paper will do. You’ll see a crescent-shaped shadow that changes as the eclipse progresses. 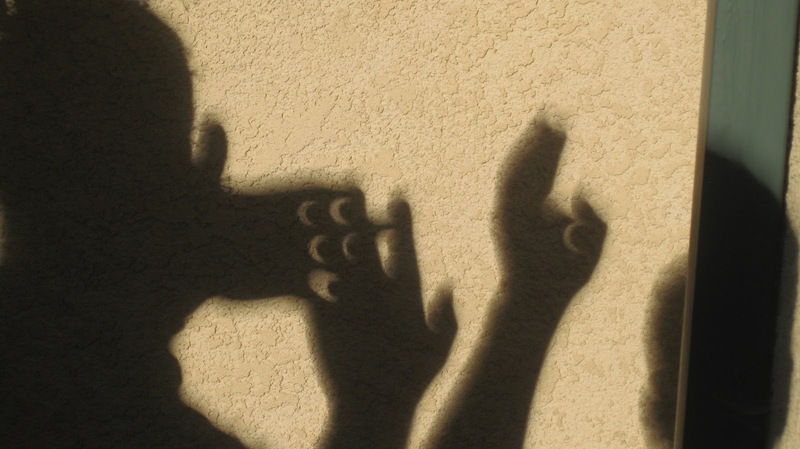 Via Rice Space Institute, a fun way to commemorate an eclipse: make a pinhole sign and photograph its shadow. The easiest pinhole projector you can make is with your hands. Stretch out and overlap your fingers to create a grid. 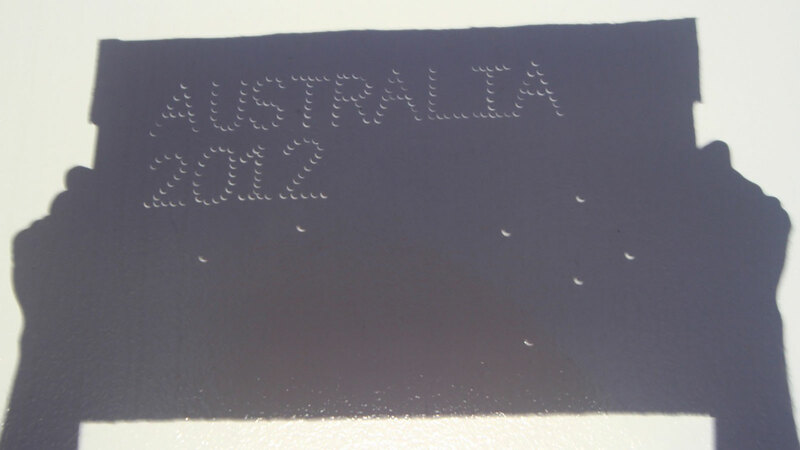 Look down and you’ll see mini eclipses projected through the spaces between your fingers. Other ideas: Use everyday objects that already have holes—like colanders or crackers, for example—or by punching a hole in a piece of cardboard or other sturdy material. If you want a more patriotic experience, NASA has 2D/3D printable pinhole projectors in the shape of the United States and each state. 2. Follow the shadows of the trees. Find a shady spot and watch as the eclipse shadows change over the course of the event. Instead of the one shadow that a standard pinhole projector creates, you can view hundreds by standing under a decently sized oak or maple. 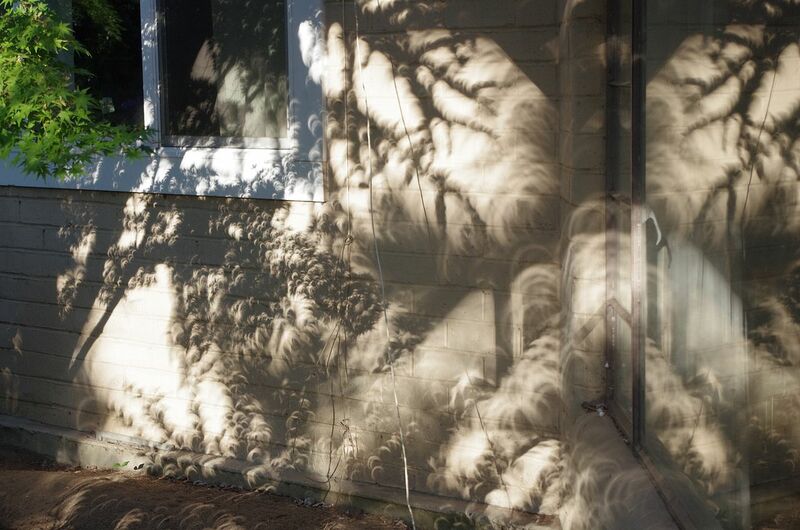 Instead of the shadows of leaves, thousands of sun crescents: the light cast through the gaps in moving leaves is only a sliver of the sun, and it shows. Photo by David Prasad from Fresno, CA., United States [CC BY-SA 2.0], via Wikimedia Commons, taken during the 2012 annular solar eclipse seen on the west coast of the United States. Another cool effect created by the eclipse is shadows that look sharper and appear to move (albeit very slowly) as the eclipse goes on. Boyce Tankersley, the Garden’s director of living plant documentation, was in St. Louis during the annular solar eclipse that passed over the United States in 1994, and witnessed this phenomenon while working at the botanical garden there. Unlike the annular 1994 eclipse, where a ring of the sun appears around the edge of the moon, the total eclipse this year will completely block the sun’s light in the path of totality (near Carbondale, Illinois, in our region). That’s because during a total eclipse, the distances between the moon, sun, and earth allows the moon to completely cover the sun; during an annular eclipse, it does not. 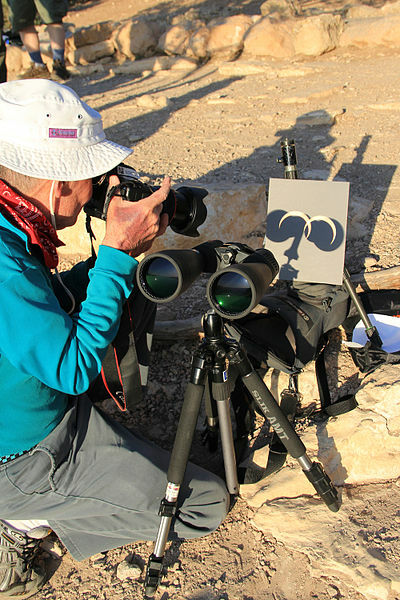 Rangers in Grand Canyon National Park use pair of filtered binoculars during an annular eclipse viewing in 2012. 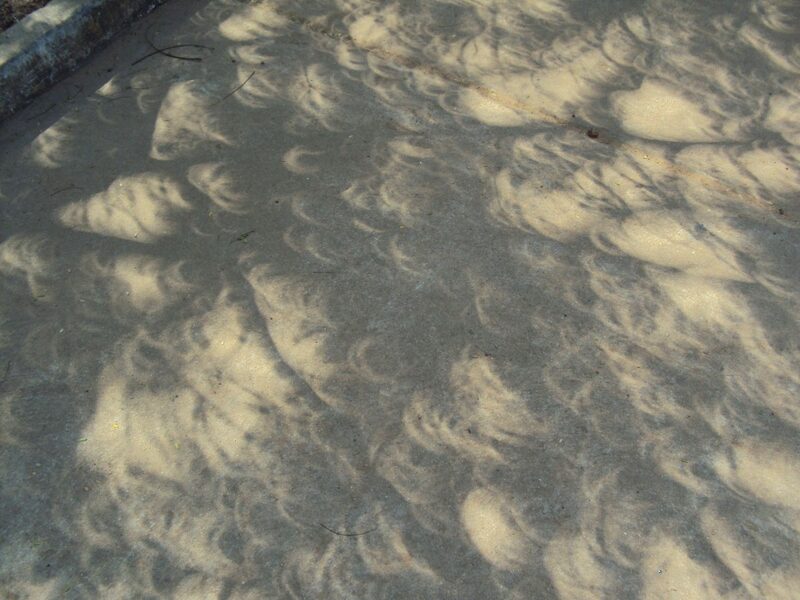 Note the crisp shadows at near-peak eclipse, as well as the crisp outline of the crescent sun. At peak viewing time, from roughly 12:45 to 2 p.m., we’ll see a skinny crescent of light peeking out from behind the moon, almost like it’s taking a bite out of the sun. Though it’s only a sliver, it’s still strong enough to mess with the way shadows appear to the naked eye. This will make for some amazing patterns and changing shapes under the Garden’s trees. If you want to experience the eclipse this way, Tankersley recommends heading to the Waterfall Garden, English Oak Meadow, or English Walled Garden. Even the Garden’s parking lots have big, leafy trees that would work. If you prefer seclusion, the west service road, stretching from the Regenstein Learning Campus to the Graham Bulb Garden, has ginkgo, redbud, and buckeye, to name a few trees in that area with interesting leaves. Use the Garden’s plant finder or download our GardenGuide app to seek out a spot to see the eclipse by your favorite kind of tree. The Garden has partnered with the Adler Planetarium to host a solar eclipse viewing event. Free special viewing glasses—while supplies last—will be available so visitors can safely view the eclipse directly. We’ll also have Family Drop-In activities related to the eclipse and a scale model of the moon, sun, and earth stretching across the Esplanade, not far from the Visitor Center. 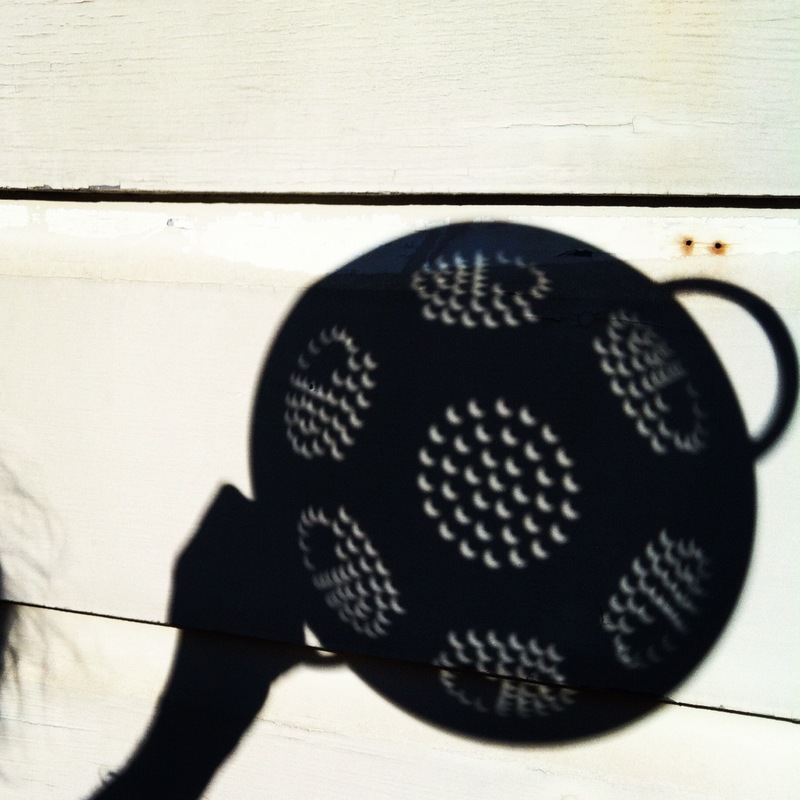 Colanders, strainers, slotted spoons, and crackers—use household objects for your own eclipse experiments. Photo via Lightscapes blog. The Esplanade is going to be a hub of activity, but the Garden has a number of other open spaces for great viewing. Grab your eclipse glasses and head to Dixon Prairie, on the south end of the Garden. When you need a break from staring at the sky, you’ll also see blooming blazing star, wild bergamot, prairie dock, and ironweed. If you’re lucky, you may also spot a hummingbird or monarch butterfly. The prairie is right off the section of the North Branch Trail that winds through the eastern part of the Garden, so it’s easily accessible if you bike here from the south. Not as off the beaten path, but usually a sure bet for some private space, is Evening Island. It’s home to the Theodore C. Butz Memorial Carillon and features different landscapes on five acres. Head to the lawn overlooking the Great Basin for a clear view of the sky, as well as sweeping, photo-ready vistas. If you’re with a small group, gather in the council ring, inspired by the work of famed garden designer Jens Jensen. If you miss this year’s total solar eclipse you won’t have to wait too long for the next one. There will be another in seven years, with the Chicago area closer to the path of totality and expected to see roughly 93 percent coverage. Practice your skills this year and you’ll be proficient in eclipse observation by 2024.